The difference in the sides of the hospital room was remarkable. A friend was in the hospital for a few days. A couple of us went up to visit in the late afternoon of the first day of her stay. There were already a few other people visiting her in the room, which quickly filled with laughter. She had the bed by the door. The table along the wall, next to the bed, had a couple of bouquets of flowers on it. My friend had a roommate, whose bed was by the window. I was later to learn her name was Lisa, and she was in our age group. Lisa didn’t have any visitors, no flowers on her table, the TV wasn’t on. She was real quiet, reading a book. She had a certain peace about her. The next day, I went back to visit my friend in the early afternoon. I was the only visitor in the room. By this time, my friend’s table was full of flowers, and a teddy bear held a Get Well Soon Balloon. My friend excitedly shared who the gifts were from. Lisa’s side of the room was still bare; no flowers. My friend whispered Lisa did not have any visitors during her stay. Lisa felt more comfortable with only one visitor in the room. She put down her book and joined us in prayer. In conversation, I learned the well-worn book was her bible, covered in a paper bag to try to keep the cover on. It had been repeated repaired with tape. Lisa shared only a little of her life: she lived in an unnamed town, in a small rented room, didn’t have much, was between jobs. She was evasive when the topic of family came up. Yet she kept telling us how blessed she was, and how thankful to God she was for all He did for her. She hugged her bible. The third day I visited, more flowers had arrived for my friend: they were on the table, on the food tray table, the chair, and had taken over some of the counter space by the sink. There was a bouquet of flowers on Lisa’s table, too. I excitedly asked her who they were from. She replied they were from the nurse; the flowers were delivered to the hospital for someone who had been discharged already. So the nurse gave them to Lisa. Lisa was sitting on her bed, dressed in a simple sweatshirt and sweat pants. She was being released that day. She picked up the bouquet of flowers, and gave them to my friend. “But I have so many, and you won’t have any!” my friend replied. Lisa had an amazing sense of God’s peace. Her words have stayed with me, and I realize that Lisa, who we thought was poor, was richer than any of us in that room. It’s nature’s sign of Endurance and of Hope: this simple, beautiful Begonia Plant. Begonias had been in a hanging basket on the deck, about 20’ away this summer; the plant seed must have sailed with the wind. Somehow, the seed found its way through the small rocks and landscape fabric surrounding a metal bucket in the lower garden. There wasn’t much room. The soil wasn’t very good, it was hard, surrounded by rocks. Sunlight shone there only a couple of hours a day. Yet, through endurance and determination, this seed grew roots, and then found its way up into the sunlight, bending as required to grow from under the base of the bucket. It continued to grow and presented its beautiful flower for all to enjoy. God’s Presence is seen in this flower: at times when we think we’re in a hard environment, when we feel we are trapped, this Begonia is a reminder that God is always near. Through His help, and our endurance, He will help us grow. With a cheery sound, the metal tines gathered colorful leaves together in an ever-growing pile as I pulled the rake through the lawn. It was rather musical: thin metal bands moving across the lawn, the gentle sound from the drying leaves as they moved. The sun was warm on my face in this late afternoon, the air crisp. Not cold; sweatshirt weather. I had come home on time from work this day, a rarity, with the goal of gathering up and bagging as many leaves as possible for the following day’s town collection. My property has several tall oaks, maples, cherry and other trees on it. Both the front and back lawns were covered with leaves of various shapes, sizes, and colors. Weather and work schedules had stalled this particular chore. I had two hours of daylight in which to get the job done. The squirrels were my companions as I worked: chasing each other around the yard, burying acorns. As I quietly went about my task, I reflected on the changes in the trees through the seasons: the stark branches against the blue-gray of the Winter sky; the gentle buds and growing leaves in the Spring; the shade cooling the house and the yard in the Summer, branches catching the ocean breeze; the spectacular colors in Autumn. I became nostalgic, thinking about the changes in my own life and how precious time was becoming. My two children, now young adults, were almost independent. There were particular times in their childhood, especially the challenging teen years, when I thought the clock was especially slow, but looking back now it all seemed to go by so quickly. My thoughts were interrupted when my son, Mike, returned home from a moving job and joined me with a second rake. Together we worked, side by side, me building up the pile, he taking them from the pile and placing them into the bag in the pail. Every once in a while, Mike would stop, put his foot in the pail and with a loud “crunch!” the leaves would compress making room for more. When the bag wouldn’t hold anymore in the pail, Mike would lift it up with a “whoosh!” compress it again, and fill it with more leaves. The full bag was tied, and then taken to the street for the next day’s pickup. During our work, we shared the events of our day. It was a simple task, raking the leaves, repeated every autumn. At the end of leaf raking season almost 100 bags will be gathered. Finances didn’t permit a budget for a landscaper to do the job. Last year, when Mike was away at sea for the fall, I had done the job myself. This year was different: Mike was home from his duties as a Merchant Marine. I thought ahead to next year; with Mike possibly away at sea and me preparing for the GOEs hopefully in January 2015, I will need to figure out another way to get this done. Luke 12:22-23 popped into my mind: Do Not Worry. “He said to his disciples, ‘Therefore I tell you, do not worry about your life, what you will eat, or about your body, what you will wear. For life is more than food, and the body more than clothing.” From Morning Prayer a gentle reminder: Worship the Lord in the beauty of holiness: Come let us adore him. I was aware of God’s presence around me: in the companionship of my grown child, the dancing squirrels, strong trees and their colorful leaves, the warmth of the sun, the seasons. God has it all under control. A sense of peace and an overwhelming feeling of joy suddenly came over me. I was grateful Mike was home safe after four months away at sea, grateful for the companionship and help with leaf raking. Mike being home was precious, a gift I don’t take for granted anymore. I offered up a simple prayer: Lord, I thank you for the gift of family, for children and for the precious time we are able to spend together. I am grateful for the safe return of Mike, and ask you to continue to hold Kathy in your loving arms. I thank you for the gifts of nature, for the trees and the seasons; for the warmth of the sun on my face. Help me not to be fearful about the future, and to remember you are with me always. “Sit, Natasha!” Please, please behave here I said to myself silently after coaxing her to sit down. Excitement and energy filled the air on the church lawn this bright sunny morning. It is tradition at this particular church to have the Blessing of the Animals as part of the main service on the Sunday near St. Francis Day. The service is held outside, on the large lawn. An altar is set at the front; metal chairs in rows are arranged for the congregation, choir and acolytes. The congregation on the day I’m writing about included dogs of many sizes and shapes, their humans holding onto their leashed canines with care. Small carry cases sat safety on their human’s lap, containing cats, rabbits, hamsters, guinea pigs, or a ferret; a child held tightly to a bowl with his pet turtle inside. It was Natasha’s first Blessing of the Animals Day, and we weren’t sure how our newly rescued sweet, gentle yet very energetic six-year-old lab would behave among all these people and pets. Well, we kind of had an idea, which is why my young teenagers and I had brought her to an empty row of seats in the back. On walks at home, she was the mayor – greeting everyone and every dog we met; she wanted to do the same here but the service was starting. Through the background noise of barks and dog movements, the service continued. An amazing thing happened at the consecration of the bread and wine: the animals became still and quiet. “Sanctify them by your holy spirit to be for your people the Body and Blood of your Son…” was heard clearly by all. The animals remained quiet through the Lord’s Prayer. They got excited again when it was time to go up for their blessings, but the timing of their quietness was amazing: animals spiritual? The Blessing of the Animals service is held in remembrance of St. Francis’ love for all animals. St. Francis of Assisi is known as the Patron Saint of animals and the environment. His feast day is observed October 4 each year in the Anglican, Lutheran and Catholic churches. Blessing of the Animals services are held at many of these churches and all are welcome. St. Francis’ love of animals is told through many stories of his kindness toward them: the rabbit he rescued from a trap, the fish he was given to eat but he set it free instead, the pet lamb that loved him and followed him around, the birds he sang to and the wolf he tamed. Francis was born in 1882 in Assai, Italy and lived the lavish life of the son of a wealthy merchant. As he matured, his encounters with beggars and lepers helped him to decide to devote his life to ministering to the poor. Over his father’s objections, Francis renounced all material values. He founded three religious orders, including what we now call the Franciscans. Francis died on October 3, 1226 and was canonized by Pope Gregory IX on July 16, 1228. 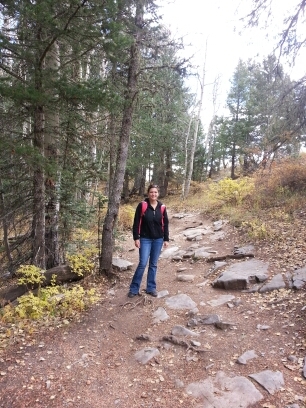 Kathy waited patiently for me in the middle of the mountain trail. I gazed from a distance at the path we were to climb: steep, rocky and looked like it would be a challenge. 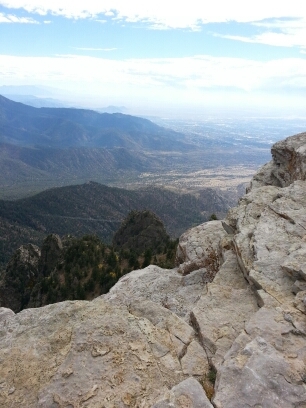 The trail was in the Cibola National Forest, located at the top of the Sandia Mountains in Albuquerque, New Mexico. We were well over 10,000 feet up; a big altitude difference for someone who lives at sea level. “C’mon, Mom! Let’s get going!” Kathy encouraged me to put down the camera and start moving up the trail. As we hiked through the woods, I took a closer look at the path we were on. It wasn’t as rough as I had imagined: the rocks had been worn by previous travelers. At the forks in the path, each way was equally worn; which fork to take was at the preference of the hiker. One fork afforded a view of the woods, the other a view over the valley. Kathy had made sure we were well prepared for the three mile hike we were taking: we wore our hiking boots, had jackets for the temperature change, and plenty of water and snacks. She advised that due to the altitude, we would take our time. We passed by many beautiful flowers growing through the rocks, in the woods, and along the side of the path, The birds sang to each other, and the sun through the trees was warm on our faces. Along the way, fellow hikers would greet us with a “Hi!”, “Hello!”, or a “How y’all doing?” depending which part of the country they were visiting from. People coming from the direction we were heading made sure to tell us of a particular path or site up ahead to see. It took us a while to climb up the pathway to our destination, but the view was worth it – we overlooked Albuquerque from almost 11,000 feet. What I had initially thought of as a difficult path and what would be a challenging journey was made easier by having a companion with me, to walk beside me. People who had walked that trail ahead of us smoothed the way; others pointed out things we should make sure to experience. It occurred to me that my life paths are like this too. Sometimes they seem difficult. But my life journeys are easier to travel with a friend, and with the advice and encouragement of those who have been down a similar path before me. God sends the right person I need when I need, and if I take the time to see Him in them, the journey is far more rewarding. God in the ordinary. “Please stand for 26 seconds of Silent Meditation” the Principal’s request sounded over the PA system at 9:30am on Friday, December 21. Students and teachers stood up in their classrooms; the clerical staff quietly rose from their desks. Support staff en route in the hallways on an errand, stopped in the hallway. Building maintenance workers put down the wrench they were using to address a plumbing issue. The kitchen staff took their hands from the day’s meal preparation, and turned off the radio. For 26 seconds, we stood, 1200 of us at a local Junior High School, to honor the memory of the children and staff who were slain the week before at Sandy Hook Elementary School. The deaths of these Holy Innocents did not make sense to anyone. Deaths of children, and our colleagues, were difficult to deal with. Hard questions were asked: Where was God when this happened? Where is He now? During these 26 seconds, the entire building was quiet. 1200 people in Silent Meditation. The Quiet Voice of God can be heard: I was there with them. I am with their families. I am here now and I will always be with you. A sense of peace… He is with us always. Dottie took the handful of coins and brought them over to containers on the shelf behind the sink in her kitchen. She reached for a ceramic jar, removed the lid, and then dropped the quarters in. The dimes and nickels went into a second jar next to it. Realizing that no, she hadn’t, she shared a fascinating story of hope. “A few years ago, my husband was suffering from a long illness. For five years there was no income. We had gone through all our savings… I had sold most of my jewelry. The housing market was terrible….our vacation home wasn’t selling and my adult kids were helping to pay two mortgages. Then he died. The bills kept coming in. “I was in a bad way, financially and emotionally. “It was to be my first Christmas without him. My oldest daughter had flown me down to her home in Virginia to be with her and her family for the week before the holiday. When I returned home, another daughter picked me up from the airport. The plane had been delayed due to a terrible snowstorm. I was exhausted. When we got to my house, I had to walk through deep snow to get to the front door. “Finally getting to the top of the stairs, I opened the storm door and a bag fell over. My first reaction was What now? “I brought the heavy bag into the house. Inside was a book and a mason jar filled with coins and a few folded paper bills. I was stunned. “When I later counted the money, there was just over $100 in it! I no longer felt hopeless, and I was deeply touched that someone would do this for me. “The giver was anonymous, and I still don’t know who gave the jar to me. “After I received the jar, things turned around. The vacation house sold. I was able to pay my bills and stay in the house we had owned for 50 years. After she shared her story, Dottie sent me upstairs to get the jar and the book. The jar was heavy, filled with coins, topped with a shiny silver bow. She had added masking tape which proudly stated “My Christmas Jar”. The book, Christmas Jars by Jason F. Wright, explained the background of the jar. On the inside cover of the book she had inscribed her name, followed by Left at my door 12/21/09. I will always be grateful to my unknown donor. If you would like to be emailed when a new post is made, enter your email address to subscribe to this blog.